With the Rise of Shadows expansion cards about to be revealed, Blizzard begins with a full live stream. Shacknews offers our full analysis. 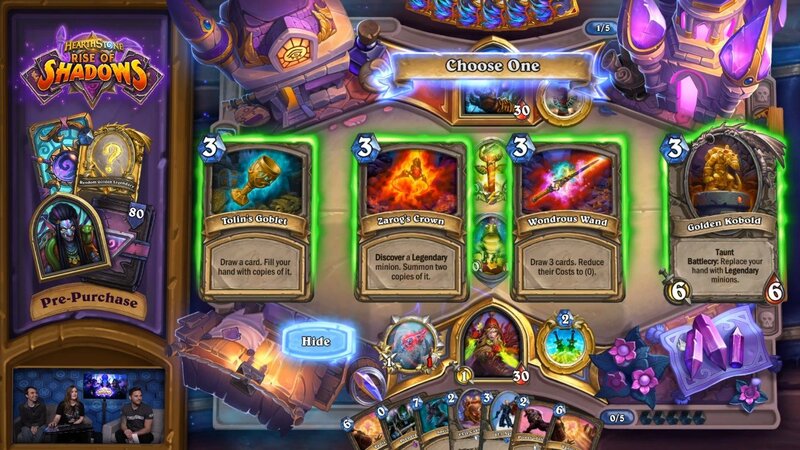 Hearthstone is in the midst of building towards its first expansion of the Year of the Dragon. The villains will unite for the Rise of Shadows, which will see Blizzard release 135 all-new cards to a fresh Standard year. 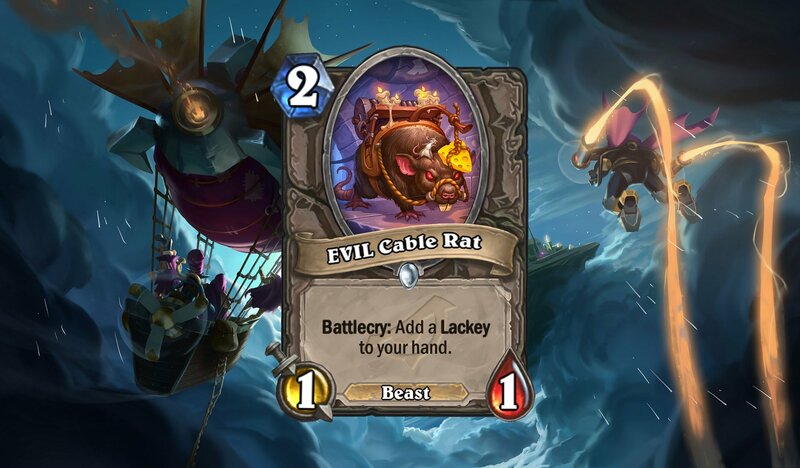 And while a handful of cards have been revealed to this point, Monday saw Blizzard take to Twitch to reveal a full batch of new cards to kick off this latest round of card reveals. Shacknews watched the stream along with the rest of the Hearthstone fanbase and we not only have a full recap of the cards unveiled, but we also have a full analysis on the big reveals. Let's take a look at what Blizzard brought out for the upcoming Rise of Shadows expansion. 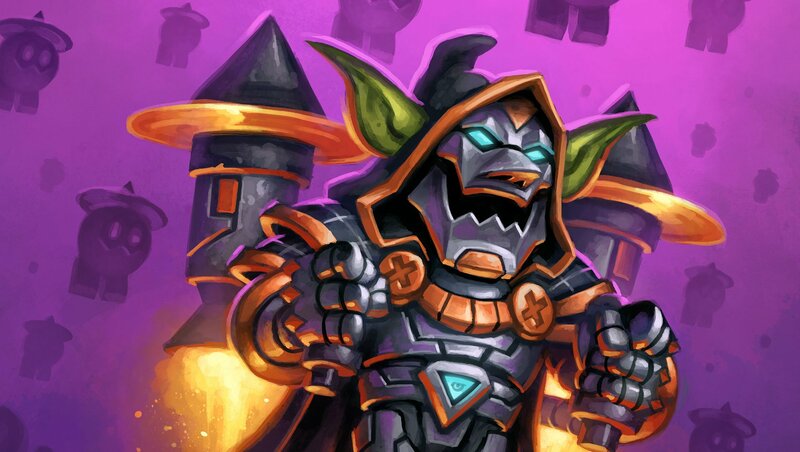 Analysis: Dr. Boom is back! Again! This time, he takes a much more familiar form as Blastmaster Boom. He retains the 7/7 body of his old predecessor, but he'll only get his accompanying Boom Bots if there's a Bomb in your opponent's deck. A vanilla 7/7 at 7 mana is halfway decent, but it was always the Boom Bots that made Dr. Boom feel overpowered. So Blastmaster Boom is ultimately successful if the Warrior player can fill the opponent's deck with Bombs. Analysis: Oh, this is a fascinating one. Seaforium Bomber doesn't quite work as a 5-drop, because there are so many other 5 drops that work better in Standard. But as a 3-drop, Clockwork Goblin could be pretty solid. As a Turn 10 play with Blastmaster Boom, it's got some fantastic late-game synergy. Even if Clockwork Goblin doesn't fit into any Standard decks, it's an above average pull from Dr. Boom, Mad Genius Discover effect. That's because it'll often come in the late game, at which point both decks will start to run low. Once fatigue starts to set in, 5 damage Bombs can swing the game significantly, even against hardened control decks. Analysis: Now this is more like it! With Blood Razor rotating out of Standard, there's room for a new weapon in the Warrior's arsenal. And on top of doing 3 damage, it'll shuffle a Bomb into the opponent's deck. That means it's possible to keep Wrenchcalibur equipped to guarantee a Turn 7 Blastmaster Boom with Boom Bots. This will be a must in Bomb Warrior decks, but it'll also fit in to just about any Warrior archetype. It's also going to be a solid Arena pull, especially when it gets drawn in the late game as both players get into fatigue. Analysis: This stands a chance to be one of the most powerful cards in the expansion, especially for Control Warrior players. That's because there's no cap to the Scheme cards. 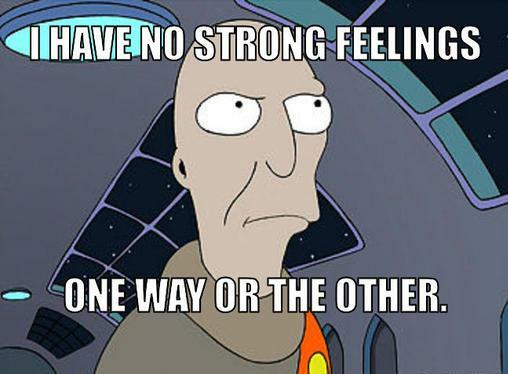 (At least for the moment. Let's revisit this if Blizzard decides to institute any in the future.) That means Dr. Boom's Scheme could start out in the player's opening hand and offer up well over a dozen Armor by the late game. It works as emergency Armor against Aggro play or when in the fatigue stage and stands to be the best Armor card in the Warrior's arsenal. This is a winner, without a doubt. Look for this to be in almost every control deck for the foreseeable future. 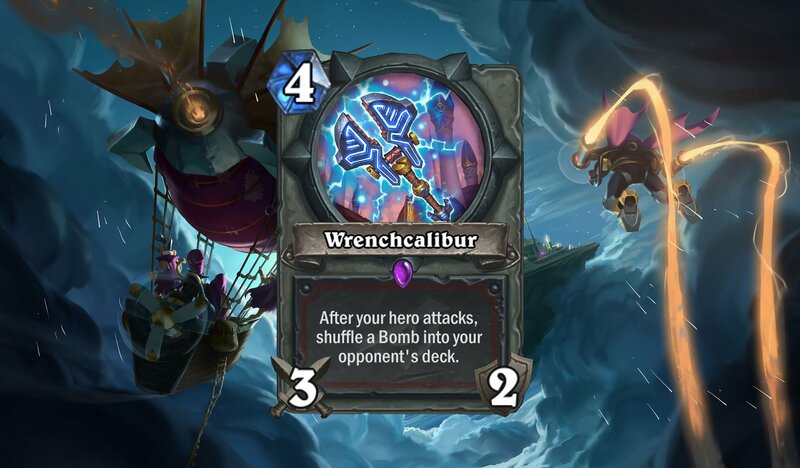 Analysis: The new-look Togwaggle is a minion that can arguably get better over the course of the year. That's because Blizzard is promising more Lackey cards throughout 2019 and part of Togwaggle's effectiveness will be determined by the power of the Lackey cards. The other thing that will make Togwaggle effective will be the treasure that he pulls out. They might look familliar. They're the same treasures pulled out from Marin the Fox. Given how cumbersome it can be to get the Marin the Fox effect to pay off, this is a much easier way to go about getting these valuable cards. Tolin's Goblet and Zarog's Crown, in particular, will be exceptionally helpful in the Rogue arsenal. The Golden Kobold will be a big boost in the late game when Rogue resources are waning. It's hard to imagine a deck revolving around the new-look Togwaggle, but it's hard to deny that these treasures are very tempting. I'd expect to see him at least a couple of times in the expansion's early going. Analysis: If Togwaggle needs easy Lackeys, this looks to be one of the more helpful cards on that end. Vanilla 1/1 stats aren't great on a 2-drop, but this will prove to be one of the simplest ways to produce a random Lackey card. But again, it's an RNG fiesta, so if you're looking for something reliable, maybe turn to something else for your Turn 2 needs. Analysis: A lot of the Rogue's good Discover cards are about to rotate out into Wild, so here comes a new one. Whether it's effective depends on how much you like those 4/3 stat lines on a 4-drop. It might fit into Pirate Rogue decks, but pulling this off of Captain Hooktusk doesn't quite work. The jury's out on this guy in constructed play. But Arena's going to love him and his handy effect, though the effect's power is up for debate. Notice the language says another class, not from the opposing class. Analysis: As the Unidentified cards leave Standard, the Rogue's about to get a brand new one. This is essentially Assassinate for one extra mana, but with a bonus effect. And those bonus effects are pretty sweet, so expect to see this quite a bit. It's a more reliable removal spell than Walk the Plank and the extra two mana is ultimately worth the extra cost, especially if it's something like the Turncoat Contract that showed up on the live stream that combines Assassinate with the Betrayal effect. This is a thumbs up! Analysis: Here's a look at the first of the Defenders of Dalaran, a force of good that Blizzard teased would stand up to the League of EVIL. This is Khadgar, who some players may already have as a playable Mage. His minion card has a strong effect that summons double minions off either minions or spells that generate minions on the board. Like similar Legendary Archmage Arugal, Khadgar is not meant for the early game, just because his 2/2 stats almost ensure he gets removed immediately. But he's cheap enough that he can be played alongside cards like Former Champ, Microtech Controller, and Unexpected Results. That alone will make him a high-demand card in Arena. Analysis: Oh, snap! This is value to the extreme! There are some valuable 6-drops to pick up off of this card, with the worst case scenario being that you might get a pair of vanilla 5/5s without their Battlecry. That's still pretty good. The best case is you pick up some situational help, like double Argent Commander or double Sunwalker. Now let's go back to Khadgar. Yes, it is possible to play Khadgar and Power of Creation on Turn 10 to drop a 2/2 Khadgar alongside four copies of a 6-Cost minion. Imagine Khadgar flanked by quadruple Illidans. 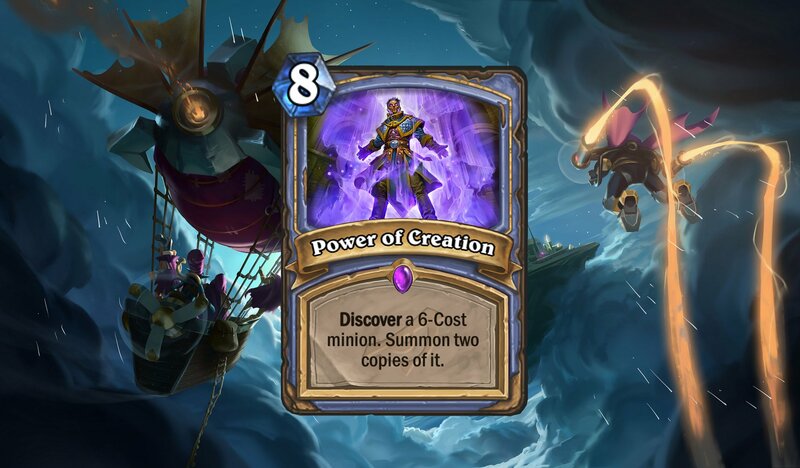 Depending on the 6-drops that show up over this and subsequent expansions, both Khadgar and Power of Creation have the potential to only get stronger from here. These are both huge winners for the Mage. Analysis: This is a tough ask for a 3-Cost 3/2 drop, but it'll at least have some value. The Messenger Raven is ultimately only as good as the Mage minion pool, which is going to look noticeably different in the new Standard. Jury's out on this one for now, but it might prove to be an expensive 3/2, even if the Discover result is something handy like Hex Lord Malacrass or Archmage Antonidas. This might pop up frequently in Arena, though, so those results should be pretty interesting to see. Divine Shield. Battlecry: Restore 3 Health. Analysis: It may feel a little underwhelming to end on a random Neutral card, but here we are. But I may or may not have a soft spot for Neutrals. The Travelling Healer may not look like much, but it's going to serve a valuable function. That's because Shroom Brewer is heading off to Wild with the Standard rotation, so that leaves a vacuum for a midrange healer. The Travelling Healer's 3/2 stats with Divine Shield make it a half-decent body and its healing effect will ensure it sees play in more than a few Warlock decks. This will also see ample play in Arena, filling the Shroom Brewer's old function. While 3/2 stats on a 4-drop may feel a little light, the Divine Shield is enticing enough to make it a stronger choice than the slightly-cheaper Earthen Ring Farseer. That's it for now! The expansion card reveals are set to get fully underway in the hours ahead, so look for Shacknews to continue our full analysis features leading up to its release. Hearthstone: Rise of Shadows is set to release on April 9. And if you missed it, be sure to check back on our first round of card analyses.